A frame consisting of two bars crossing each other at right angles and turning on a post or pin, to hinder the passage of animals, but admitting a person to pass between the arms; a turnstile. 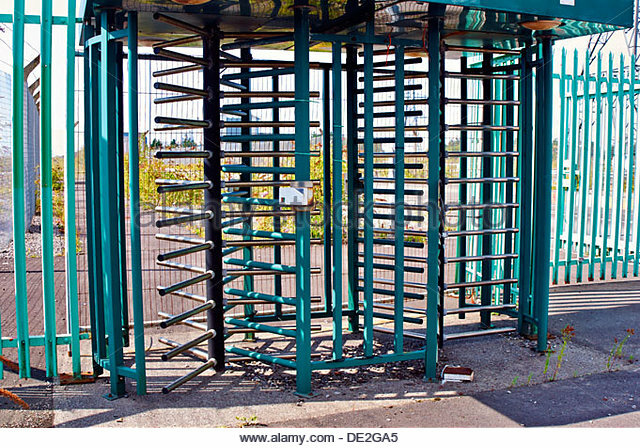 A gate or bar set across a road to stop carriages, animals, and sometimes people, until a toll is paid; a tollgate. Is one of these the origin of the word? Did turnpike refer to more of a turnstile device or a single-bar traffic gate, or something else? He made a dyche of grete coste, Pyght with stakys that wolde perysce, With turnepykys, and with many an hers. The sense of turnpike as a horizontal cross of timber turning on a vertical pin (a turnstile) is attested from 1545, and the turnpike as a barrier across a road used to prevent passage until payment of a toll is from the late 17th century. From there, of course, it came to refer to the road controlled by a turnpike, whence its use in the U.S. for certain toll roads. As has been mentioned in other answers, the earliest meaning of turnpike offered by the OED refers to a barricade "as a defence against sudden attack, esp. of men on horseback." Several of the citations provided seem to suggest that a turnpike in this sense could be opened or closed, which explains the use of the word "turn." My lord hath do brokyn all the passages excep Newhom bryge, weche ys wached and the turne-pyke shette euery nyght. They had no Drawbridge but only a Turnpyke. From the meaning referring to a barrier that can be opened or closed, it makes sense that later meanings referred a toll barrier or a turnstile, whether on roads or waterways. Finally, attested in 1748 is a definition that refers to it simply as a shortening of "turnpike road," which has its own separate entry in the OED. A road on which turnpikes are or were erected for the collection of tolls; hence, a main road or highway, formerly maintained by a toll levied on cattle and wheeled vehicles. Also fig. Turnpike roads were not known in that part of England till some years after. So it seems from examining the entries in the OED that a turnpike originally referred to a barrier, likely a movable one that was meant to block intruders, and this term was adopted into the compound form turnpike road, meaning a road that contains turnstiles for paying a toll, which was in turn shortened back to turnpike, hence the meaning referring to roads with toll passages commonly used in the U.S.
A single-bar barrier is the original meaning, referring to medieval verb turnen, meaning "to turn," and the noun pike, meaning "a sharp-tipped weapon. The word itself doesn’t come from turning spikes, but from turn and pike, the latter in the old sense of an infantry weapon with a pointed steel or iron head on a long wooden shaft. It’s the inclusion of turn here that suggests the pikes were the barrier, which could be turned aside about a vertical pivot to allow access.